The witnesses to the Book of Mormon never recanted about seeing the golden plates the book was translated from. If you say that the testimony of Jesus’ disciples about His resurrection (even at the expense of their own lives) is evidence for the truth of the resurrection, why don’t you accept the evidence offered by the Book of Mormon witnesses? Have you thought about this one before? How would you respond to this? Take a shot, then on Thursday, Bill McKeever of Mormonism Research Ministry will be here with Brett to give his answer. I’ve done a bit of dialogue with Mormons before. I never actually discussed this question before but I do know how I would answer it. Let’s start by examining the testimony of the disciples. They all claimed to have seen the resurrected Christ in the flesh. They touched Him, saw His wounds, listened to him and even ate with him. They testified that He performed actual miraculous signs in their presence. Most importantly, they confirmed that all these things PHYSICALLY AND ACTUALLY happened to them. It was NOT a mass vision or some sort of supernatural spiritual experience. Facing the penalty of death, each and every one of them refused to recant their testimony, even though doing so would have saved their lives. Now, let’s ask some important questions about the testimony of the respective three and eight witnesses (two different groups of people) who testified to having seen the Book of Mormon. Many Mormons are ignorant of exactly what these peoples’ testimonies actually were, but if we examine the primary Mormon documents (Book of Mormon, History of Joseph Smith, Doctrines and Covenants, etc. ), red flags starts popping up all over the place. First of all, in every testimony of each witness, they all give reference to “seeing” the golden plates “through the eyes of faith.” Strange language to use if you are simply talking about something that you physically and actually witnessed. If we investigate further, we find that Joseph Smith took his three witnesses into the woods where they prayed until they all had a vision where an angel appeared to them and showed them the golden plates. To be clear, this was A VISION. Not one of his witnesses physically saw the golden plates. According to Smith this had been strictly prohibited. In fact, during the translation process, the plates were wrapped up with cloth the entire time. Joseph Smith told his followers that the angel had prohibited him from showing to plates to anyone, and after the translation was finished, the angel took the plates into heaven. 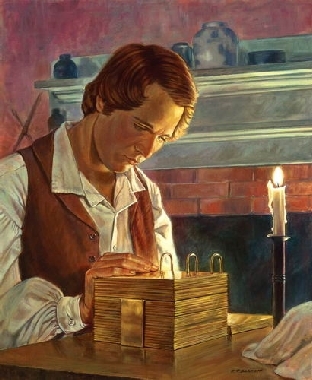 Seeing as the “witnesses” only saw the plates through a vision, there is only one person who can claim to have physically seen the golden plates and that is Joseph Smith himself. Now, if the plates were a physical thing that Joseph Smith had dug up himself, why was it necessary for his followers to see the plates in a vision. When Jesus carried out his ministry, the Bible makes it clear that all his miracles were real. 5,000 people actually touched and ate the food that he gave them. After the resurrection, more than 500 eyewitnesses actually saw and touched him. Why would an angel forbid Joseph Smith from producing tangible proof that would dispel any doubt about his experience, seeing as Jesus produced tangible proof all the time? These questions are left unanswered. This among many other things casts a great deal of doubt in my mind about the testimony of the Book of Mormon’s translation. Furthermore, Joseph Smith himself made numerous changes to his original testimony as the years went by (this is all documented in his own writings). With such dramatic changes in testimony, I really start to wonder if he is just making it up. To close, I actually do not doubt that some of Smith’s followers had a supernatural experience. Remember, the Bible says that the Devil possesses the power to deceive, and this sort of “vision” fits that criteria exactly. However, the disciples based there testimony on being an eyewitness of actual, physical events. Who are you going to trust? What Spencer said. None of them actually saw the plates with their own eyes. Some of them claimed to see visions of the plates. Some of them got to feel them while they were hidden under a blanket. I am also under the impression that all of the “witnesses” of the plates left his church. Is this true, I don’t remember my source. I know that at least David Whitmer left the church, but I don’t think he ever denied the Book of Mormon. He only denied Joseph Smith’s later revelations, in part because he saw at least one fail, after which JS told him by way of explanation, “Some revelations are of God, some revelations are of man, some revelations are of the devil.” The problem was that Smith, by his own admission when he said that, couldn’t tell the difference. Another response would be to correct the premise of the question. We don’t claim that the willingness of the disciples to die for their testimony of their witness of the risen Christ is necessarily evidence of the truth of the resurrection, but rather that it is evidence that they were not lying. It is logically possible (although not really plausible,) that they were all mistaken, but it is clear they really believed they encountered the risen Christ. Since liars make poor martyrs, their willingness to die was testimony to their honesty. If the so-called witnesses to the book of Mormon were unwilling to recant, that only proves they probably believed they saw it, not that the book was real. Spencer just about got that one. I would only add one thing to what he had to say. The witnesses of the golden plates had no way to verify that what they saw was actually what Joseph Smith claimed it was. The only thing their testimony shows is that they witnessed Joseph Smith revealing something to them that he claimed was the true gospel. This testimony lends nothing of proof about the authenticity of what Joseph claimed they were. Is there good evidence to back up the claim that the disciples died FOR their faith in the resurrection, and that them recanting Jesus’ resurrection would have saved them? I think the source for this is traditional, not historical. But I could be wrong.